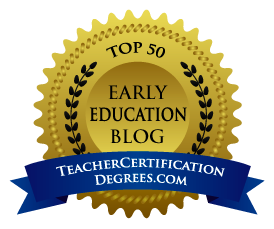 So honored that my blog was named a Top 50 Early Education Blog! I share this award with all of the amazing bloggers that I follow and my own followers. You have impacted my teaching in so many ways. I look forward to reading your posts, comments and emails daily. Here is what they had to say about A Place Called Kindergarten...Veteran teacher Jonelle Bell borrows a book title from Jessica Harper for the award-winning blog, A Place Called Kindergarten; Starbucks and Diet Cokes head the list of essential teacher supplies for this self-confessed label lover who shares ideas for turning kids into non-fiction writers and keeps a jar of Smarties for smarties on her desk. WOW! Congratulations! I am addicted to your blog, so, I am not surprised that it gets so many accolades! thank you for sharing your wisdom!